Feature Packed with Power to Spare The TX-NR676 can drive your surround system with ease while reproducing even the most demanding soundtracks with clarity not heard before. This thoroughbred A/V receiver streamlines access to app-based music, on-demand TV, games, and more. Linking your 4KTV and up to seven media players over HDMI, the TX-NR676 processes all the popular Hi-Res and object-based audio codecs while Dynamic Audio Amplification reproduces sound flawlessly for an adrenalin-pumping theater experience. Future-focused, the receiver plays almost any audio accessible to your mobile device or PC over dual-band Wi-Fi, and comes with Chromecast built-in* and DTS Play-Fi*, which make mirroring music a one-tap operation. You can share network content, analog audio from your Blu-ray Disc player, turntable, and more to supported network multi-room speakers over FireConnect powered by Blackfire. Any way you add it up it’s a receiver packed with features and one of the best sounding amps available. Backed by 70 years of experience building high-grade audio components, the TX-NR676 amplifies accurate, noise-free signal processing with high-current power for dynamic speaker control. The result is pure, rich and authentic sound. 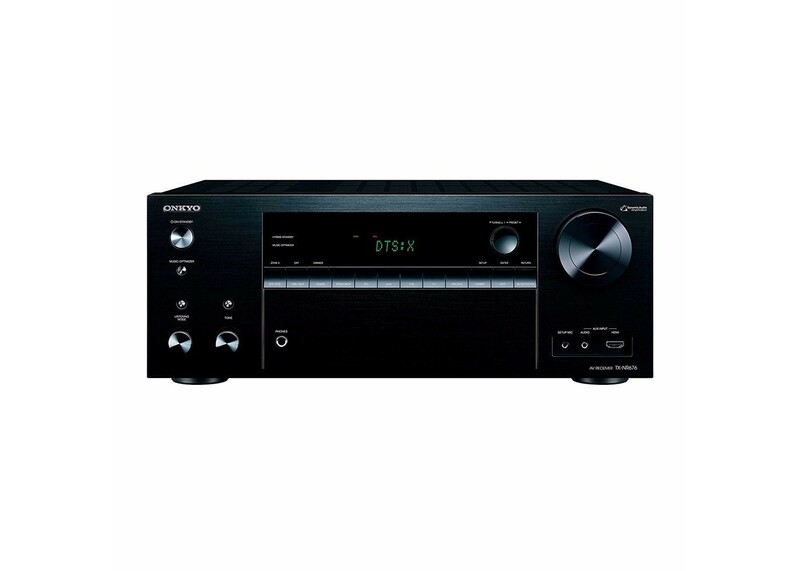 Onkyo's dynamic audio amplification delivers massive power at 210 W/Ch (6 Ohms, 1 kHz, 10% THD, 1 Channel Driven)/ 100 W/Ch (8 Ohms, 20 Hz–20 kHz, 0.08% THD, 2 Channels Driven). Stream any music from your smartphone, laptop, or PC to the TX-NR676 with ease. Control playback with Chromecastenabled apps you know and love from your iPhone, iPad, Android phone or tablet, Mac or Windows laptop, or Chromebook. DTS Play-Fi is a wireless protocol that works with any audio app on mobiles and PC. Flick whatever’s playing to the receiver, even different sources to different components at the same time. FireConnect mirrors network audio and external analog sources connected to a master component—from streaming services to vinyl records—on FireConnect-compatible speakers in other rooms. Music selection, speaker grouping, and playback management across the home are built into Onkyo Controller app for iOS and Android. Six rear HDMI inputs support pass-through of 4K HDR in both HDR10 and Dolby Vision formats; the BT.2020 4K Video Standard, 4K/60 Hz video playback; and HDCP 2.2 for premium content. Further, front HDMI is available for easy connection of a video camera or game console, while a rear Sub Output is ideal for connecting a projector. High current power is proven by the ability to drive fourohm speaker loads, which will severely test the strongest multichannel amplifier. Heaps of muscle means superior control for improved clarity and transient response, restoring energy to stereo and multichannel sound. Further, VLSC eliminates pulse-noise for optimal playback of high-quality stereo sources. With your speakers and media players connected, plug in the AccuEQ mic and let the GUI guide you through initial setup, from speaker calibration (including AccuReflex phase correction for Dolby Atmos-enabled speakers) through to network connection. The refined interface makes control simple and enjoyable.